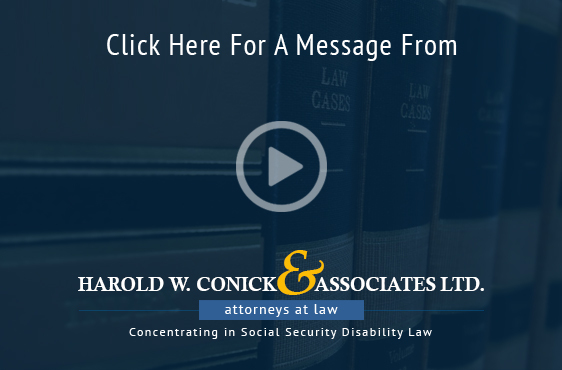 Harold W. Conick & Associates Ltd. is concentrated to practice in Social Security Disability Law as well as Veterans’ Disability Law. We will provide you with full service throughout the entire disability process regardless of the level of your appeal. We are tough advocates who fight for our clients rights. Are you suffering from an injury or illness that is preventing you from working? Has your application for Social Security Disability Insurance (SSDI) or Supplemental Security Income (SSI) been denied? Are you a veteran of the armed forces seeking veterans’ disability benefits? You are not alone. At Harold W. Conick & Associates Ltd., we will assist you throughout the disability claim process, from filling out the claim forms all the way to appealing unfavorable decisions to the Federal Court or US Court of Appeals for Veterans Claims if necessary. As your case progresses, we closely track the status while it is pending with the Social Security Administration or Veterans’ Administration. We realize that this is a difficult time for you, and you must have many questions. Harold W. Conick & Associates Ltd. is here to help. Contact us today for additional information or a free case evaluation. If you are unable to work because of an injury or illness, call us today. Let us put our experience to work for you. I would like to commend the Law Offices of Harold W. Conick & Associates, Ltd. on the excellent job they did to help me get social security disability. They helped me through a very complicated process which I would not have been able to do alone, especially considering my severe health issues. All my questions were answered immediately, and the process went smoothly. I would especially like to thank Jim Kane, who always went above and beyond on my case. He made a very trying time easier for me and my family. Thank you for helping me get awarded Social Security benefits. Everyone on your staff was very helpful in keeping me informed with phone calls and letters. Just want to thank you again and you will be well recommended. Thanks to Mr. Conick (and his associates) I won a 4 year long battle (1 year with them) for disability. I would highly recommend Mr. Conick, he is very professional, knowledgeable and kind. I don't know what I would have done with out him. I highly recommend him!